The BRIC nations(Brazil, Russia, India and China) are at the core of a new economic optimism in the whisky world, the kind of which has not been seen for decades. The increasing affluence of these populations have created an emerging middle class that wants "the best, and are prepared to pay for it," to quote Ian Buxton in Whisky Magazine (Issue 67, p17). Luxury is the key of the day for those fortunate enough to not only have clean water to drink, but to have clean water to put into their £1000 drams. This small percentage of the market is putting an increased demand on the maturing whisky supplies of Scottish distillers and creating new frontiers for the brand wars. For some time now Johnnie Walker Blue has been the symbol of whisky luxury, THE premium brand whisky, and in recent years EVERYONE has come out with new premium product to compete: Cutty Sark 25, Dewar's Signature, Chivas Royal Salute and the new 25yo, etc. One reads of Johnnie Walker King George V and 1905 blends. Crown Royal XO and No. 16. Whyte & Mackay 40yo. Royal Salute 38 and Coronation Cask (50yo). Crystal decanters, swords, necklaces and silver cups accompany many of these ultra-premium expressions. 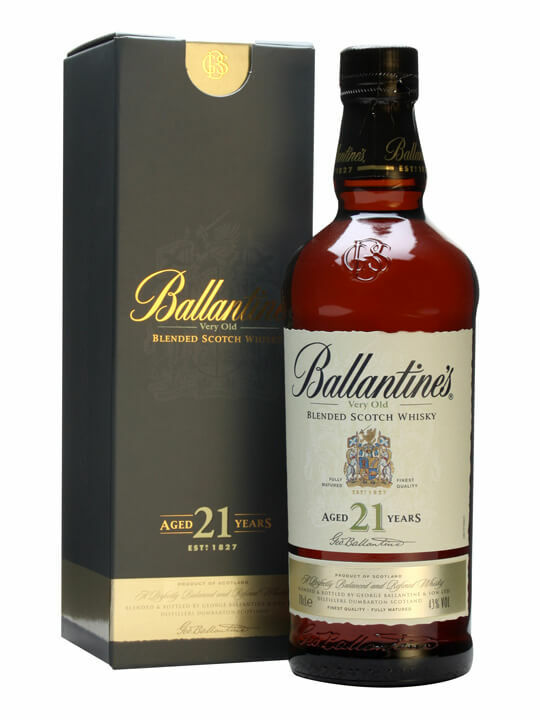 Ballantines seems to have avoided this ornament and cash cropping. Their premium blends (which have been around for decades) have always come in simplest of packages, winning awards and loyal long-term drinkers. No oak boxes or accompanying gauntlets, the 30yo was even sealed with a screwcap the last (and only) time I had it. Put as many velvet bags and mahogany boxes around my bottle of whisky as you like, it makes it no less a trophy for the rich. Whisky is to be consumed, not hunted, shot, and hung on the wall. And for the industry to be nurturing this gluttonous malt-hunting is greedy and, some would say, short-sighted. It seems certain that it will come back to bite them in their arses later if not sooner. With every boom in the history of the industry there has been a subsequent bust. Now, with millions of pounds being dumped (prematurely?) into silly new user-unfriendly websites, new bottling plants, and new distilleries, the increasingly worrying question to those of us who care about the long-term sustainability of Scotland's national drink is not "WILL there be a bust? ", the question is "WHEN?" Forget Dumbarton today. I will type about that lost distillery some other time. Artificial grape, grape gum or something, or medicinal grape! like chewable Tylenol for kids? Soft, toffeed and round. Strawberry yoghurt, vanilla with a backbone of oak, and some smoke. Fennel, citrus vitamin C tablets. Big and deep, cigar smoke, dust, and a rich, pleasant bitterness. Long woody finish with tobacco, kiwi fruit, and citrus. Leather and oak in the finish. Powerful with great depth. A full circle of flavour without being robust. The citrus tang is kept in check with fruit, malt and vanilla, with a pleasant oaky bitterness to add balance. A whisky that sensually weaves flavours through your gums and around your tongue. Classy blending.